On Tuesday, Daesh terrorists reportedly sewed up the mouths of four Mosul residents with metal wire for discussing the success of Iraqi Army in the offensive anti-terrorist operations among themselves. A local resident of Mosul told media, that ISIS has spies around town who report on citizens who talk about the victories of the Armed Forces of Iraq. Anyone caught discussing the ‘enemy' is punished in public. The militants are seriously concerned by the growing belief amongst the public that Mosul is on the brink of liberation after a series of failures by ISIS in other cities around the country. "Four of our residents were discussing the success of the army in a casual conversation about politics, when another man suddenly joined in. He casually discussed with them the defeat of ISIS and offensive operations in Nineveh. Later, all four people were caught. Right where they were standing, their mouths were sewn up with metal wire," said the resident, whose name has not been disclosed for obvious security reasons. 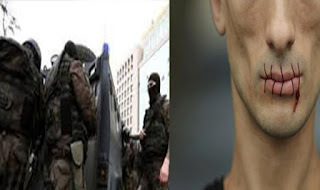 The terrorists put their victims into the open trunk of a car, showing their sewn up mouths to everyone, in an attempt to intimidate the population and prevent and talk of the victories of the government troops and the people's militia, Sputnik reported.